Pyaar Ka Punchnama team returns with yet another rib-tickling comic-caper. Read in-depth review only on BollywoodMDB. Titu (Sunny Singh) and Sonu (Kartik Aaryan) are best of friends who are inseparable. However, their envious friendship is put to test when Sweety (Nushrat Bharucha), who works for an NGO, enters their lives. After getting dumped by his girlfriend of many years, Titu decides to settle down with Sweety as she comes across as a perfect, marriage material woman he can spend his whole life with. While Titu and his family are ready for the union, Titu's friend Sonu has his own doubts and reservations about the sweet-natured girl. He finds her too good to be true. To save his friend from getting into anything dodgy, Sonu decides to find out the real self of Sweety and thus begins a war between bromance and romance. What happens next forms the crux of the story. Sonu Ke Titu Ki Sweety brings the prominent cast of Pyaar Ka Punchnama 2 back. All the three lead actors - Kartik Aaryan, Nushrat Bharucha, Sunny Singh - are convincing in their parts. However, it is the pair of Kartik Aaryan and Nushrat Bharucha that carries the whole film on their shoulders. In the role of Sonu, Kartik Aaryan is great. His boyish charm works in his favour and you just can't stop loving him throughout. The actor binds you with his enthralling act. Nushrat, on the other hand, is very much in sync with her character. She plays a witty, manipulative and clever girl. The actress gets into the skin of her character and delivered a performance that is likeable. Sunny Singh is also good, but he looks flat in many of the scenes. After the massive success of Pyaar Ka Punchnama 2, director Luv Ranjan brings yet another comic caper which revolves around the same tropes of love, friendship and loyalty. But here, he gives a lot many twists and turns to his story to keep the repetitiveness at bay and reel in the maximum number of the audience. But despite him trying his best to make you forget the world he had created in his Pyaar Ka Punchnama 2 series, that vibe and feel somehow creep in in his latest outing. Having said that, his film works due to the real and hilarious performances of all three protagonists. He gets you invested in the movie from start to finish and that is perhaps the most-sought-after quality in a storyteller. Apart from helming the project, Ranjan has also co-written it along with Rahul Mody. He does a good job in both departments. Luv undoubtedly knows the pulse of the young audience in India which makes his films immensely relatable. All Luv Ranjan films have one thing in common that they are sleek and visually stunning. Sonu Ke Titu Ki Sweety is no different. The film looks so cool and full of colour that you cannot take your eyes off. And the credit for the work goes to the set design team along with cinematographer Sudhir K. Chaudhary who has lensed it beautifully. Talking about editing, barring a few scenes which could have been cut short, there is nothing much to complain about. Production value is rich. The film boasts of an incredibly catchy soundtrack. 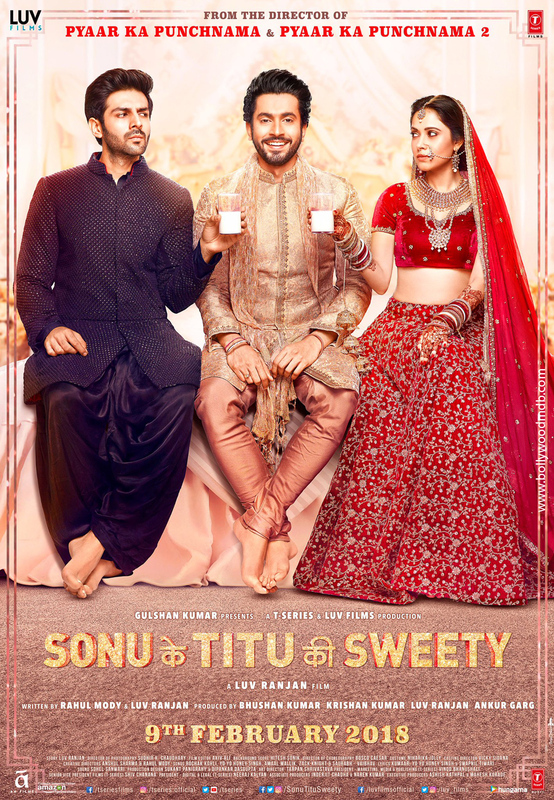 With a perfect blend of some classic old numbers and new songs, the album of Sonu Ke Titu Ki Sweety is totally intoxicating and foot-tapping. Songs like ‘Dil Chori’ and ‘Bom Diggy Diggy’ are infectious and can make you move on the go. Sonu Ke Titu Ki Sweety is a cute and delightful film that deserves at least a watch this weekend. It’s a pleasure to watch a comic caper that talks about romance and bromance in equal measures and in a vibrantly witty manner. Yo Yo Honey Singh clocks 9 million followers on social media!